What newly married couple doesn't dream of a romantic retreat where they can escape the world for a while - but what happens when supernatural forces intrude on their wedded bliss? Nine of today's hottest paranormal authors answer that question in this all-star collection of supernatural stories. Can a vampire-hunter enjoy her honeymoon when she's just learned that her new hubby is a werewolf? How can newlyweds focus on their wedding night when their honeymoon suite is haunted by feuding ghosts? And what's a wizard to do when a gruesome monster kidnaps the bride on her way home from the wedding?With so much otherworldly mayhem awaiting our newlyweds, will they ever get around to the honeymoon itself? ©2007 St. Martin's Griffin (P)2009 Audible, Inc. 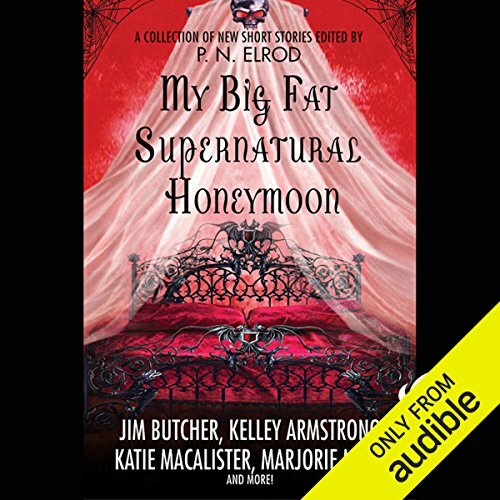 I would recommend this to anyone who likes this genre or anyone who read 'My Big Fat Supernatural Wedding' (only one story carries over). 85% of the stories caught my interest and were fun listens. The narrators were chosen well. I enjoyed listening to this book and you will too. The Butcher story was good. I bought this for the Dresden files story which was wonderful. However, if I knew then what I know now having just finished it I would’ve only listen to that story and not bothered with the rest. If you by Jim Butcher for the intelligence, quick wit, and intriguing story lines then the rest of the stories will leave you wanting. Some of the readers were so juvenile sounding that I started wondering if this was his book meant for younger readers. It’s not that there are voices were young but that instead of acting the book I felt like I was listening to someone sitting on a bed reading out loud. It was better than I thought it would be. It would have been better if the same gender narrator read their part and the opposite gender read their part.